I got some great pictures this weekend and just had to share them! 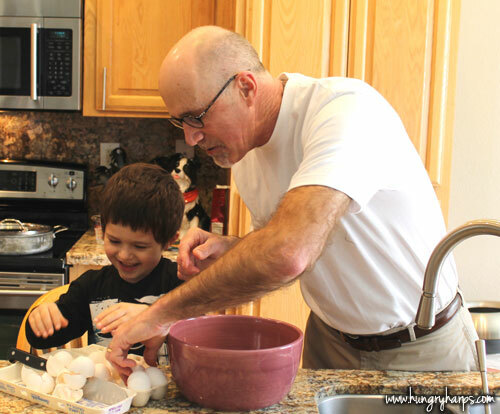 My dad enlisted the help of my oldest son, Bubba, in the kitchen on Sunday morning to get ready for brunch. I would normally of written "help" when talking about Bubba, because it is usually more work having him in the kitchen than anything else, but he surprised me this weekend. Thus my reason for writing this post. The first job my dad gave Bubba was to crack open the eggs. What?!?!? I immediately had to grab my camera and get ready to witness and capture the mess of a lifetime. After all, Bubba just turned 4 in December and is not exactly a fragile flower. However, something else happened - he did great!! I couldn't believe it. He also helped make pancakes - actually flipping over a couple, all by himself! 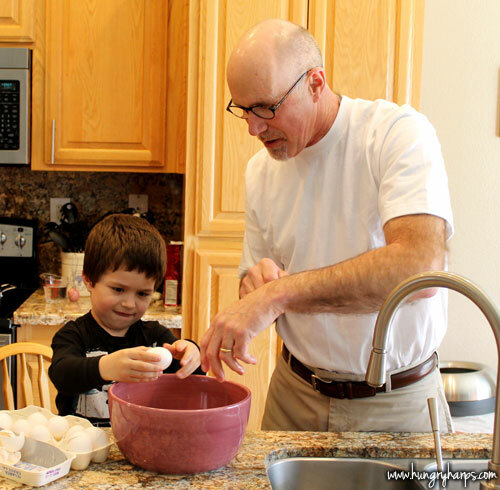 As I watched my dad with his grandson, I saw something missing in my own life. I saw patience. I simply have not tried letting my son crack open eggs because of a mess that I would have to clean up or because of a few wasted eggs. It makes me feel really horrible as a mom and it makes me wonder what other things I am keeping him from trying for pure selfish reasons. It was an eye-opening moment that has changed my life. 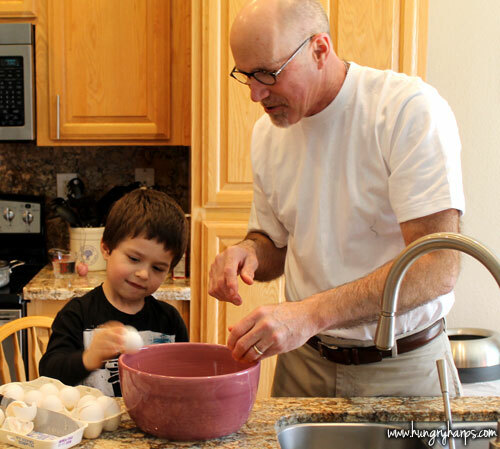 Watching my dad with his grandson also took me back to when I was young, back when my dad was enlisting my help in the kitchen. He must of had great patience then as well, but I was unable to see it. I wouldn't have learned anything he taught me about cooking if he had not been patient - and now it's my turn. I have changed a lot since becoming a parent, but I think patience is the one thing I could still work on. Do the lessons of parenthood ever stop coming?